While I’ve been loving the crop top look on other people, I never considered it as something I could pull off. I am certainly not model thin and don’t have rock-hard abs, but after seeing the the midi skirt + cropped look everywhere I figured I might give it a try! No harm, no foul, right? Let’s just say I was more than pleasantly surprised. I was expecting to be turned off by how I looked in a crop top because my mid-section has never been my best asset, but what’s great about pairing a crop top with a high-waist midi skirt is that you barely even see a sliver of skin. You get to wear the cropped look without feeling or looking bare – genius! While a fully cropped look is not in my future, I am proud of myself for stepping out of my comfort zone and giving this look a try. I believe this cropped top by Apiece Apart will become very useful in the scorching summer months here in Texas, don’t you? I’m tempted to also get it in black for fall, however I’ll likely throw a jacket over my shoulders for a more sophisticated look when that time comes. crop top well done, I also love your adorable sneakers. Love this outfit! The bright skirt, top and necklace are perfect together. Love the shape of this top – so pretty & perfect for spring/summer! Loving this crop top!! It works perfectly with that skirt and the added sneaks is a great way to dress it down! Love everything about this! You look fantastic in a crop top, and the way this one flows is perfect. Also, totally obsessed with those sneaks! I’m loving those Kate Spade shoes – great post! I love how you wore this crop top, I’m usually not a fan unless it’s with high waisted bottom so this is perfect and love how you wore it with those adorable polka shoes! 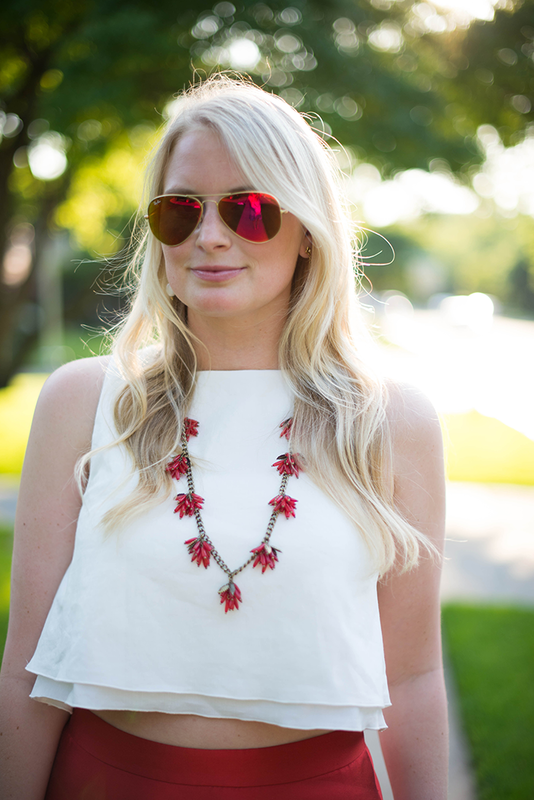 That red is the perfect color on you…love the necklace too! You look awesome! Love that shade of red!!! I love these aviators and this skirt! I love how you paired that lovely skirt with those adorable shoes! It’s so unexpected and way too cute!! This is the perfect way to wear a crop top. It’s just a hint of skin. Tasteful yet fun. I’d love it in black too with black cigarette pants and a great pair of JImmy Choo pumps! LOVE this look! So chic. Perfection, girl! Great skirt, I think you look fab in red! As a fuller chested, and more curvy, gal I had the exact same hesitation about the crop top trend but I think I am in love too! This entire looks needs to be in my closet asap! Just too perfect, loving that bold red color on you! Love that top and how it just shows a bit of skin, loving how you dressed it down with those sneakers – so fifties-esque ! Merritt, you look amazing! This outfit is stunning and the red looks incredibly on you! Love the top, skirt and necklace! Love a crop top and a full midi skirt! This is such a classy way to wear a crop top. I love it! I love that red skirt! It looks darling on you! love the balance of this look with the crop top and full skirt and the glam fabric with the sneaks – you look so gorg! I’m with you I want to try the look too but between not having abs and having triple D’s. I’m just not sure, but I must say you pulled it off perfectly. Love the look. I LOVE this outfit! And how you dressed it down a little with the keds! Holy gorge—you look amazing! Love the just-barely-cropped top, a-line skirt with sneakers AND the red accents. Probably one of my favorite looks of yours to date!! You look gorgeous!!! 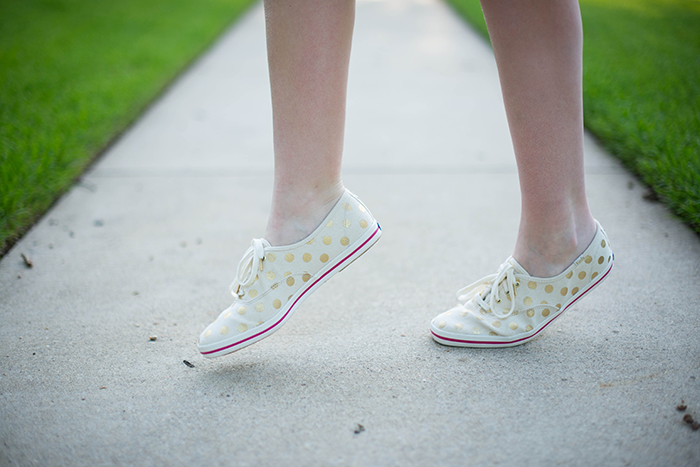 Love those gold polka dot sneakers! So fun seeing you in Dallas! In love with this outfit!! Looks amazing on you! Love this look! The red Ray Bans are such an unexpected spin on an old classic. Perfect. This look is insanely cute! I love the crop top paired with a fancy skirt and those Kate Spade shoes! Perfect! Holy hell. This is awesome. I think it is my new favorite look of yours. LOVE IT SO MUCH! Love this look with the crop top so much! I feel the same way about crop tops! I have yet to try them… I’ll have to try with a midi skirt like this to overcome my fears :) You look amazing. Great look, Merritt! Hottie with a body! And, I love the way you casualized an otherwise dressy skirt.